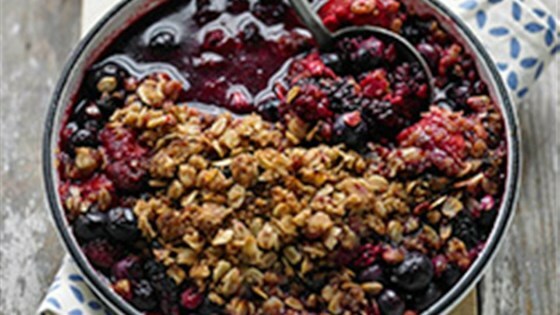 "Mix fresh fruit with kitchen pantry staples for a delicious dessert. Check the pantry for soybean oil--it's labeled vegetable oil." Flour Mixture: Combine flour, oats, brown sugar and soybean oil in small bowl. Mix with fork or finger tips until crumbly. Sprinkle the flour mixture over the berry mixture. Bake for 20 to 25 minutes until topping is light golden brown and fruit mixture is bubbly around the edges. It was great no easy to make but would like to see what oven temp to use. I went with 350 which seemed to work well. Easy recipe with some blueberries and plumbs from the backyard. Cooked @350. Used honey instead of brown sugar. Making again with blackberries and peaches. Quick and easy. I substituted Splenda and Agave for sugar. Lower in calories and was delicious!